With the perfect location (almost in front of the best local beach! ), spacious and decorated common areas, bbq area, pool and ping pong table, cozy bar, living, tv room, kitchen, sea view balconies, great coffee shop (with real coffee!!! ), comfy beds and efficient staff. Backpackers Hostel Iquique guarantees you an unforgettable experience with the best price-quality of the city. Our comfortable and friendly hostel offers you single, double, triple and shared rooms all with shared or private bathroom option. All the shared rooms have lockers to keep your things safe, USB and own light points. 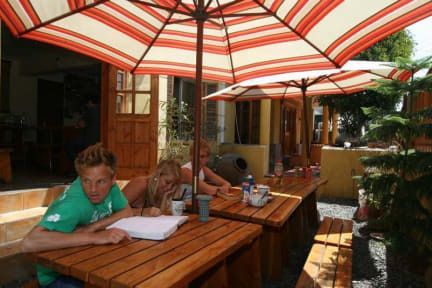 Backpacker's Hostel Iquique is the most recommended hostel in Iquique with more than 14 years of experience, located just across the street from the best local beach and only ten minutes from downtown. Great place to be the hostel offers u every kind of service the atmosphere is great, receptionists are very kind, cleanliness is perfect made, beds are comfortable and u can use the BBQ whenever u want, moreover it is located just 2 minutes walking from the beach which is great both to relax or surf! Really enjoyed my time!! Really chilled hostel just 1 minute walking from the main beach (you can actually see the sea from the terrace at the 3rd floor). I stayed both in a doble room and in a dorm. Really clean and confortable. Best thing was the really relaxed atmosphere. Would definitely go back.